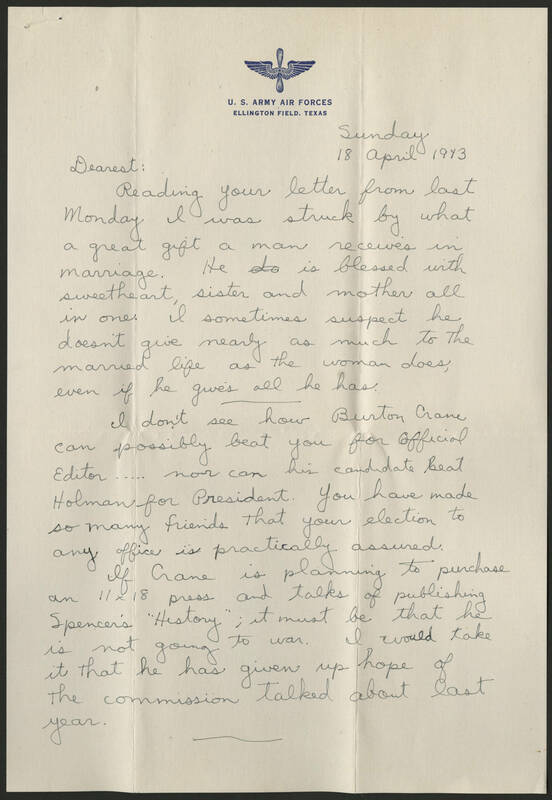 Sunday 18 April 1943 Dearest: Reading your letter from last Monday I was struck by what a great gift a man receives in marriage. He is blessed with sweetheart, sister and mother all in one. I sometimes suspect he doesn't give nearly as much to the married life as the woman does, even if he gives all he has. I don't see how Burton Crane can possibly beat you for Official Editor .... nor can his candidate beat Holman for President. You have made so many friends that your election to any office is practically assured. If Crane is planning to purchase an 11 x 18 press and talks of publishing Spencer's "History"; it must be that he is not going to war. I would take it that he has given up hope of the commission talked about last year.